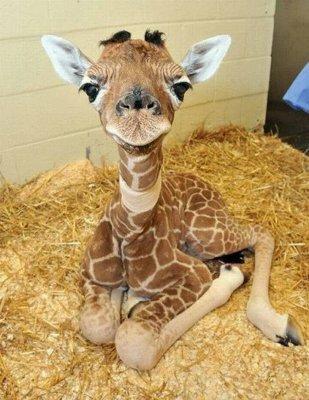 One could say that the baby giraffe has a rather rough start in life. Its mother gives birth to it standing up, or even walking, and the drop is about four feet to the ground. This breaks the umbilical cord, but it leaves the baby giraffe a bit disoriented for a few minutes. Fortunately, the baby giraffe, or calf, is up on its feet and nursing after about 15 minutes. Most calves are born in the dry season. Most giraffes only have one calf at a time and they give birth every two to two and a half years or so. The length of a gestation can range between 400 days to 468 days and female giraffes have the sole responsibility for raising their calves. The age of weaning for a baby giraffe depends upon its gender. Males are weaned after about a year to 14 months while females are weaned from about a year to sixteen months. A calf is independent by the time it turns three years old. In the meantime, the mother's preoccupation is to keep her calf safe from all the predators in the area, which includes lions, leopards, and hyenas. This means that the baby hunkers down on the ground for most of the day. Its spots and patches help to give it some camouflage. The mother is never more than 80 feet away and she returns to the calf at night to nurse it. If she sees a danger to her calf, the mother will run up and try to kick it away. Still, only about 25 percent of baby giraffes reach adulthood. When the calf is about a month old, the mother takes it into a crèche, or calving pool, which will allow her to go farther afield to find food and water while another mother guards all the calves in the group. Still, the mother giraffe returns at night to feed and watch over her own calf.